The little blocks that got me distracted have turned into a bit of a rage! I never imagined. If you missed the post let me explain. I was looking at quilts made from shirts for Kelli and I came across a website Floating on a Cloud….and this quilt. Photo Courtesy of the site. Link here. I told about it in the blog post on Monday. I have had LOTS of people ask about the size and dimensions of the blocks. I’ve had people making them, sending a picture to make and saying “look what you got me doing”. Well…I thought I might as well take come pictures and write a post telling how to make them. First off I want to say if you are going for the look of the original quilt, I suggest that you mostly use plaids. If you look close, most of the blocks are make with plaids. I have LOTS of striped shirts so I am using them too. I don’t care if the lines of the stripes go every which way but some people do. I’ve also studied the original quilt and noticed that many of the blocks are mismatched and the colors change within the block. I decided I like that variety and prefer to replicated it. I’m also throwing in some perfectly made ones. For the sake of the ease, I’m going to show you how to make a perfectly made one. These are churn dash blocks. They finish at 5″ so unfinished is 5 1/2″. 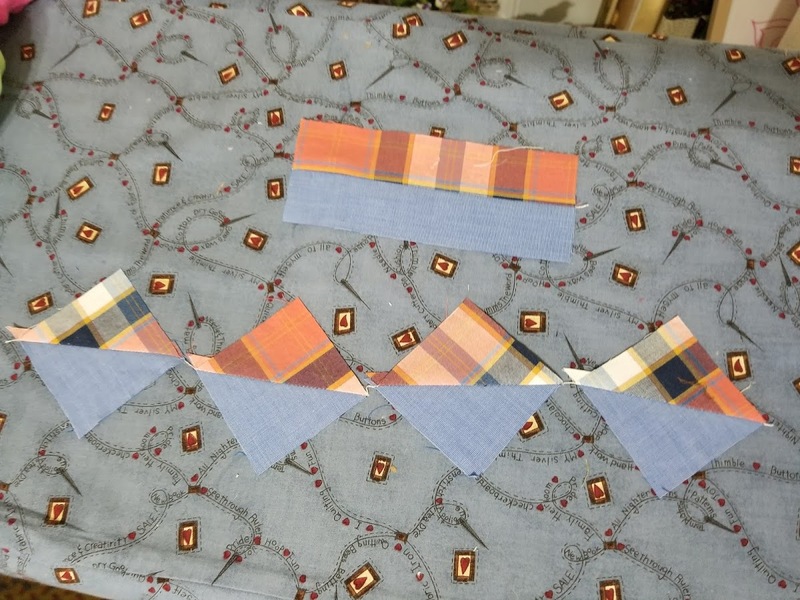 With that in mind, here’s what you need to make a block….I use strips and my Easy Angle ruler. My strips are 2 1/2″. I took two pieces of fabric that were 7″ long, paired them together and cut four half square triangles. If you aren’t an Easy Angle girl, make 4 half square triangles in your own method that will be 2 1/2″ UNFINISHED. Then I cut two 1 1/2″ strips are 6 1/2″ long. I also cut one 1 1/2″ square. I put them through the machine and ended up with this…. Then I cut the strip into four 1 1/2″ segments. If you’re a presser that’s fine. Press however you want. These blocks don’t but up next to each other so seams don’t need to coordinate with an adjoining block. All pressed, you have this. I laid a few of the blocks together to see what they would look like. After seeing this I think I am going to make most of my alternate “blocks” be plaids…a few stripes but mostly plaids. Here’s my block all nestled in….cute. I love the background on that one. I snapped a picture of a few other of my blocks so you can see the variety. I love the blue and orange one…so cute with all the mismatch prints. I’m happy to see I’m not the only one that caught the bug. I was debating on how many to make. I want to make a queen sized so the blocks finishing at 5″ I thought of making something 90″ x 90″…I might add borders or something but that’s a good start for a center. 90 divided by 5 is 18 so that means at 18 x 18 setting. That means 324 blocks total…about half are pieced so that means I’ll make 162 and then see where I am at….I’m thinking about some border but nothing has come to me yet….any ideas? So there you have the fully disclosed information about the little churn dash blocks….who all is making these with me?? This entry was posted in Ask Jo on February 27, 2018 by Jo. Love this quilt! Haven’t started yet but it’s calling. Thank you!! Love these blocks! I have a couple boxes of cut up shirts, so that is a start. Jo, what about using piano keys for a border as a thought? Luv it my have to make after I finish Moth in the Window . I’m not sure it needs a border, but it might be fun to make extra churn dashes and then turn them into square in square blocks so they look like they were set on point (or do wonky ones that “churn” around the quilt). These blocks are so darned cute. I certainly have the shirts so i guess I’d better get busy. Thanks Jo! Thanks Jo, the blocks are calling my name. Going to the thrift shop today. Can you estimate how many shirts this may take? Yep, yep, yep, fell into them , trying to use up scraps from shirts. . .love the mismatched ones the most! Looking good and thanks for the tutorial. Yes, I’m catching the bug. I think I might go for a solid stop border and then a braid border. I usually don’t press also till the block is done or just finger press a little. You could do it with that I think. Happy hunting. I’m joining you Jo! This little block really appeals to me! 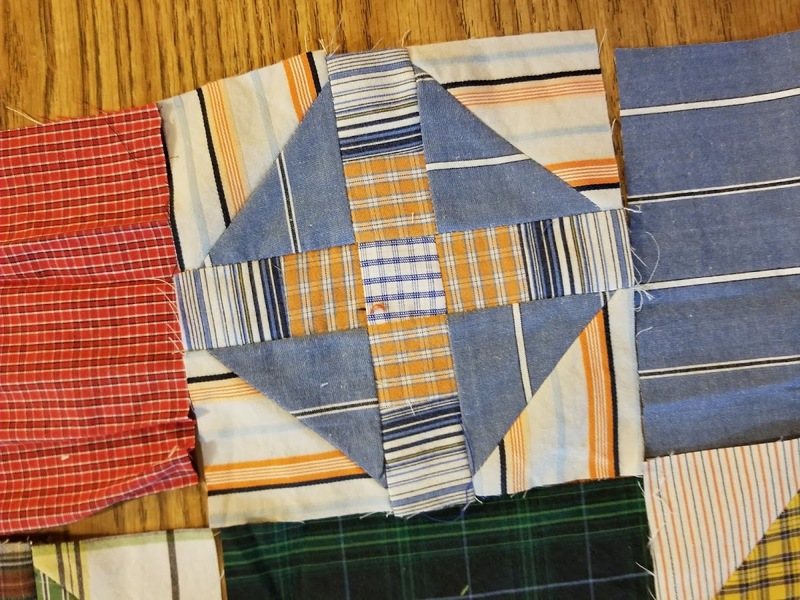 Finally I will make a quilt from my late husband’s shirts ~ lots of stripes, plaids & solids! Perfect! Thank you for the directions last wk & today for making these cute little churn dash blocks! This is going to be a beautiful quilt!! How about the churn dash blocks made into square in a square so they look like they are on-point for the border??? Really cute! I especially love the darkish reds in her quilt! Perhaps, a solid color for the border?